Talk about woolly ears . . . Pamella's mother was Reserve Grand Champion at Kamloops in 1992 in the light/medium wool class. 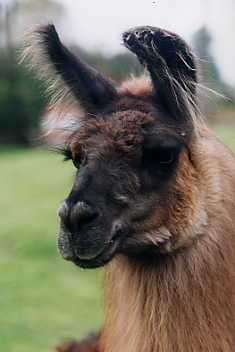 Her father is very woolly and Pamella has a beautiful heavy coat of brown fibre. She is a big girl already and is ready to breed either to one of your studs or one of ours. For more information on Pamella or any of our other animals drop us an e-mail.